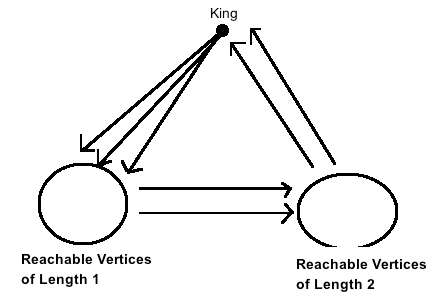 Definition: In a tournament graph $T$, a vertex $v \in V(T)$ is a King if and only if for every other vertex $x \in V(T)$ there exists a directed path from $v$ to $x$ with a length of at most $2$. We will not prove this theorem, however, it is important to note this important result. Also note that in a tournament, the vertex with the greatest out-degree is the king of the tournament.